I was going to talk about my weekend since things actually happened but I'd like to discuss something that is driving me NUTS!!! Yes I know it's terrible isn't it? This cowlick is one of the most annoying things EVER! It wouldn't so awful if I had left my hair curly, then I would understand since I brought it upon myself. Nope, I blow dried and straighted the darn thing. What makes this cowlick even more annoying is the fact that sometimes it's content to not appear. It's like it says to itself well you went through all that work today with your hair I'll stay put. Then days like today it's saying screw you it's Monday and I don't care! I try putting in under my bangs to hide it ... five minutes later it's back out. Wet it a bit and hold the hair tight to try and get it out ... nada. I even use my lovely CHI straightner on the sucker and sometimes it will still pop back up. I have actually cut it before to mesh with my bangs and a few days later it's back. Every time I use the rest room and I wash my hands I see it there just mocking me. Grrr. Probably what drives me even more crazy is how everyone thinks it's so cute. No it is not cute! It's annoying! 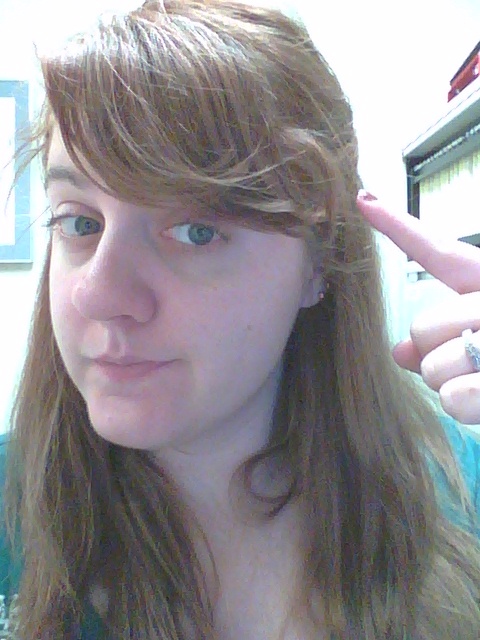 I just want it to swoop with the rest of my bangs is that really too much to ask of a measly little two inches of hair? I feel like it's not. It has been absolutely WEEKS since I've linked up with Jenn on a Monday. It's been one of those things where I just wasn't working on my goals so I'm starting with a clean slate and not even looking at my last set of goals. The nuns decided they would keep me on a couple hours a week to work on cataloging work from home. Since I was sick for almost the past two weeks I didn't get anything related to that done. 4. Get two birthday month posts written. I have some ideas in my head of fun things but should really get them "on paper"
5. Find my pedometer at my parents house or get a new one if I can't find my old one. My new job has a walking (and running bleh!) incentive program and I really should start up on that since I can earn a couple vacation days! Good luck with your cleaning!! I can totally relate. I just got "side swept" bangs again and even though I try to blow dry them them opposite way to train the hair, it doesn't work. My husband thinks bangs are cute on me and I should have never listened to him! Never again. Love that incentive to exercise for vacation days at work. I wish my workplace had that. You have seen my cray hair (which is what I call my cowlick). I try to do something cute= nope it is whatever my hair wants (which is what I call my cowlick). I try to cut it= nope it is whatever my hair wants(which is what I call my cowlick) I straighten and put product in = nope it is whatever my hair want (which is what I call my cowlick). This is why I look the same in every pic we take... Goal for your bday is to look different in your bday pics!